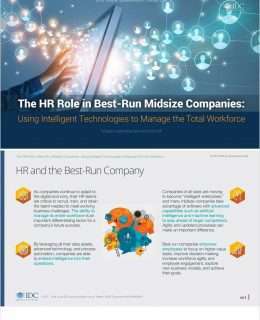 HR executives in best-run midsize companies take the lead in aligning the workforce through the use of modern technologies. IDC conducted a survey of 1,957 midsize companies (100–1,000 employees) worldwide to identify key factors associated with business success and progress toward becoming a best-run, digitally engaged company. The respondents were categorized into four groups based on their performance: laggards, survivors, strivers, and best-run.